Heavenly Father, your cosmic gaze focused on dust and you fashioned in your image and likeness every man and women: give us, we beg you, a keen eye to recognize that image so that respect for all human life becomes our way of life. Grant this through Christ our Lord. Great Interview about the New "Handbook for Catholic Moms"
Check out the blog at Aquinas and More for a great Interview with Lisa Hendey on the "Handbook for Catholic Moms"
Book Review: "My Big Book of Catholic Bible Stories"
I was so excited to get “My Big Book of Catholic Bible Stories” in the mail. Well- known Catholic writer and editor Heidi Hess Saxton has done an incredible job pulling this valuable resource together. Over 175 Bible Stories have been culled from the New Revised Standard Version Catholic Edition text. To supplement these, Saxton has included an introduction, a prayer, and a “Going Deeper” section for each story. The “Going Deeper” features further references relating to the story and actions one can take to further one’s knowledge or put the Bible lesson into practice. For many of the stories, there are also “Did You Know?” features which add a little bit of extra information, a “Quote of the Day” from a saint, or “Special Words” which emphasizes vocabulary one might not be familiar with. She has also interspersed pages dedicated to Catholic prayers. “My Big Book of Catholic Bible Stories” is attractively designed, with kid-friendly headings and color-coded sections. The beautiful illustrations by Natalie Carabetta only add to the experience. This is a book that children will greatly enjoy looking at and sharing with their parents. It is primarily targeted to the 7 – 12 age range, although children younger and older could certainly benefit from it. 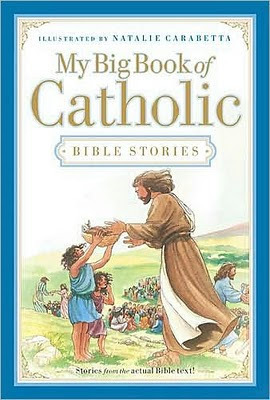 I heartily recommend “My Big Book of Catholic Bible Stories” to any Catholic family searching for a kid-friendly Bible. Perhaps the best endorsement is how much my two boys (ages 7 and 8) enjoyed looking through this book. They said it was much better than the kids’ Bible that they currently have! Book Review: Do I Have to Go? "Do I Have to Go? 101 Questions about the Mass, the Eucharist, and Your Spiritual Life" is primarily written for teenagers and young adults who are questioning the reason for needing to go to Mass each Sunday. Yet, Matthew Pinto and Chris Stefanick have gone far beyond their intended purpose. This book is a succinct study in why our Mass is the way it is and the benefits it holds for our lives. It is worthwhile for anyone who wants to learn more about the Mass. The question and answer format makes it very readable. The questions are ones that many may have asked. Examples include, "How do we know that God exists?" "Why does Mass have to be so boring?" "Do I really have to go to Mass every Sunday?" and "What evidence is there that the early Church believed in the Real Presence?" Pinto and Stefanick are able to take some very complex realities and make them understandable. "Do I Have to Go" is also a great resource for when someone asks a question about our Mass and you aren't exactly sure of the answer. In reading this, I learned several things about why we use the words we do and make the gestures we do at certain points in the liturgical celebration. 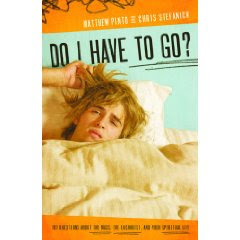 I highly recommend "Do I Have to Go?" for anyone who has questions about the Catholic Mass. Book Review: "In Name Only"
Searching for a page-turning historical Catholic novel? 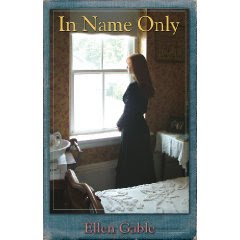 "In Name Only" by Ellen Gable is one book you won't want to put down until you finally reach its satisfying conclusion. Caroline Martin is nineteen years old in 1876. Having taken care of her father in his final years, she is now setting off to begin a new life with her wealthy uncle and cousin. While adjusting to life in the upper class, she meets two brothers who will play a prominent role in her future. Liam is dashing and always a gentleman. He sets out to woo her heart with class and dedication. David is a well-known ladies man, accustomed to having his way with any woman he desires without much care for the consequences. When tragedy strikes, David and Caroline will be forced into an unlikely alliance which will challenge both of them and change them forever. "In Name Only" is a wonderful story, full of plot twists and turns. The main characters are well-developed and the supporting characters add much life to the story. While the novel features much tragedy, it does seem plausible at a time in which death was a much more constant companion than it is today. It is a Catholic novel and shows what it meant to follow Catholic teaching at that time period. It is not heavy handed, however, and I firmly believe that anyone who enjoys romance or historical fiction will greatly enjoy the story. I relished my time with this book. Each week, Sunday is meant to be a time of celebration, a mini-Easter, an opportunity to worship and rejoice and rest! How lucky we are! Yet, sometimes, we do not view it that way - especially we moms who never actually get a day off. Sundays simply result in a different set of duties. Even going to Mass can be a struggle. There is the effort of getting everyone up and out of the house (sometimes with considerable protestations). Then, there is the challenge of keeping everyone quiet and well-behaved in Church. Anyone who has experienced Mass with a crying baby, screaming toddler, or antsy preschooler can relate. Mass can be the most stressful hour of the week! Yet, it is still important to go. The Eucharist feeds our soul, giving us strength for the week ahead. Two young people that I know of (one age 11 and one age 15) in my own community took their lives this past year due to bullying. In light of that, this film seems very relevant. Find out more about the movie at www.tosavealifemovie.com . I am pro-life. I have always felt that abortion was wrong and that I would never have one, but at one time I did not think I had the right to tell anyone else what he or she could or could not do. Then I had a miscarriage. Only two people looked at my loss as a reason for grief. I am still grateful for their sympathy. That loss changed me. I began to realize that babies, like the one I had lost, were killed on a daily basis. Others referred to these unborn as “a blob of tissue,” but I knew they were children. The abortion procedure, with its horrific list of side effects, was down played as safe and easy. I became angry at the lies foisted on women. We will never know the potential of all the babies whose lives have been lost to the legalized murder of abortion. We cannot know the effects on all of the women who have had an abortion. We do know, however that many of these women regret their “choice.” They long for a chance to make things right. We must offer our prayers for these women. When I had been divorced for a couple of years, I was not living my faith. I became pregnant. There was never any doubt in my mind that I would have the baby. I did consider adoption, but ultimately decided to keep the baby. She is a great source of joy in my life. She is a very vocal pro-life teen now. She recently thanked me for having her. She wrote to me, “You could have had an abortion but you didn’t.” The irony in this statement is that when I was pregnant, someone told me something similar, “You could have had an abortion. No one would have known.” There is no truth to the statement, “No one would have known.” I would have known and God would have known. In his book God is Near Us, Cardinal Ratzinger (now Pope Benedict XVI) discusses the issue of how to receive, emphasizing that, instead of arguing about whether it’s better to receive kneeling or standing, in the hand or on the tongue, we need to focus on the spirit of reverence with which the early Fathers of the Church received Communion. concerned only to argue in favor of … a reverence in the heart, an inner submission before the mystery of God who puts himself into our hands.” (God is Near Us, San Francisco: Ignatius Press), pp. 69-71. Thus the ritual of kneeling and receiving on the tongue, which was introduced in the ninth century, was also “quite justified, as an expression of reverence, and is well founded.” But certainly, “the Church could not possibly have been celebrating the Eucharist unworthily for nine hundred years” (p. 70). The rituals authorized by the Church may well continue to change as the Church continues to mature. What must always remain is reverence for the real presence and tolerance for the various ways of expressing that reverence, for in the dispute that “has broken out concerning the Eucharist … the opposition of one party to another threatens to obscure the central mystery of the Church” (p. 57). “They should make a throne of their hands, laying the right upon the left to form a throne for the King, forming at the same time a cross. This symbolic gesture, so fine and so profound, is what concerns him: the hands of man form a cross, which becomes a throne, down into which the King inclines himself. The open, outstretched hand can thus become a sign of the way that a man offers himself to the Lord, opens his hands for him, that they may become an instrument of his presence and a throne of his mercies in this world” (p. 70). The pope admonishes us “not to forget that not only our hands are impure but also our tongue and also our heart and that we often sin more with the tongue than with our hands.” He explains that, by coming to us in communion, “God takes an enormous risk … allowing not only our hand and our tongue but even our heart to come into contact with him. We see this in the Lord’s willingness to enter into us and live with us, within us, and to become from within the heart of our life and the agent of its transformation” (p. 71). Like many of you, I won't be able to walk in person at the March for Life tomorrow. However, we can be with the marchers in spirit. Perhaps tomorrow we can fast or say some extra prayers to be in solidarity with those out there making all our voices heard. As some of you may be aware, I have loved art all my life. 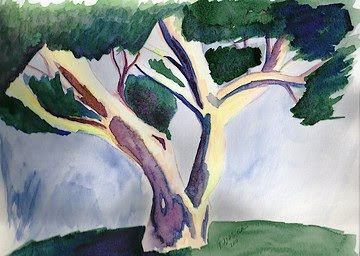 Some of my fondest memories as a child involve spending quiet time painting or drawing. When I went to college, I decided to major in art, despite the fact that I had never had a formal art class. The course work was challenging (don't ever let anyone tell you an art major is easy!). I worked hard, though, and I loved it. Over the years, I have kept my creative side working in various ways. I have done graphic design and web design. When my older son was little, I attempted a career as a professional artist. I sold a couple paintings but not enough to make a go of it. When my second son was born, I put the brushes away, and turned my attention to other creative pursuits such as writing and quilting. 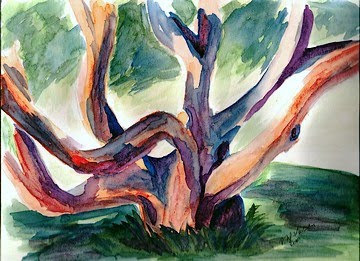 I picked up the brushes again briefly in 2004 or 2005. I was giving a one-evening watercolor workshop and wanted to make sure my skills were still there. I had fun and enjoyed giving the class, but then the brushes went away again. It seemed such a waste to paint with no purpose. At least my writing I can share with people. Quilting was practical. When you are done, you have something to keep you warm or give as a gift. The paintings just took up space in my closet. No one wanted them. There was nothing I could do with them. I did a big purging last weekend and threw many of them away. (I did take photographs of them 1st so I have a record). This year, I've been teaching an art and history class for my homeschooling co-op. It's been great. I enjoy getting ready for class each week. We are using the Picturing America series. Each week we talk about one of the pictures - discussing the art and the history of America at that time. Then we do an art project related to the lesson. All that working with people creating art has made me miss my own painting. So, after I finished my quilt for 2009 (a present for Isaac) and got caught up on my scrapbooking (which hadn't been touched since July), I took out the old paints and brushes. I was so excited to do so. The results are above. One done each of the past Saturday nights. I plan on continuing to paint when I can. I'll probably share them here and will most likely offer them for sale. I'm not sure how long this new painting experience will last, but I am enjoying it. Book Review: "Have a Little Faith"
In Have a Little Faith: A True Story , Mitch Albom, the author of such best-sellers as "Tuesdays with Morrie" and "The Five People You Meet in Heaven" has once again hit a home run. This true-life tale begins with a question. An elderly Rabbi named Albert Lewis asks Albom to give his eulogy. Taken aback by the question, he asks the Rabbi, who he refers to as "Reb" if he is dying. "Not yet," he replies. In many ways, "Have a Little Faith" is about that "not yet." It is about the journey that Albom takes to get to know this Rabbi better as well as the spiritual journey that takes place within Albom as a result. Interspersed in the story is the tale of another man of God, Pastor Henry Covington. Covington has taken an unlikely route to the ministry and ministers to unlikely Christians. At first, the reader will wonder how these two tales are connected. The story of an upstanding Rabbi facing his decline, and the tale of a young drug dealer seem to have little in common. Albom, always the consummate story teller, has done a fine job of interweaving them into a beautiful portrait of what it means to serve God. The reader will have to wait for those connections to make themselves clear, but the wait is definitely worth it. At the time when Albom is asked to write and deliver Lewis' eulogy, he hadn't really been around him in twenty-five years. Even as a child, he had attempted to run away from him. "He was tall, six foot one, and I felt tiny in his presence. When he looked down through his black-rimmed glasses, I was certain he could view all my sins and shortcomings. So I ran. I ran until he couldn't see me anymore." As an adult, Albom had moved away both figuratively and literally. He decides he needs to get to know Lewis better in order to do him justice in this final farewell. What Albom thinks will be a few meetings turns out to be eight years of interaction. Albom deftly shares stories from long ago with lessons from the "Reb" now until the reader is granted a very moving picture of him. In one particularly insightful passage, Albom tells of the Rabbi's pain when his young daughter died. Albom asked him that unanswerable question, "Why do bad things happen to good people?" he honestly answered "No one knows." Yet, this never caused the Rabbi to question his faith in God. Atheism held no appeal for him. He stated, "It is far more comforting to think God listened and said no, than to think that nobody's out there." The Rabbi also shared his great secret of happiness with Albom. It's very simple, really - be satisfied and be grateful for what you have. "Have a Little Faith" is about the journey - of these two men of God who Albom rights about and about Albom's own journey. Yet, readers will find their own journey in these pages as well, for humans, regardless of their faith traditions, reach out for the God that created them. We are always searching and hoping to discover more. In his conclusion, Albom writes that "it hit me, finally, that this was the whole point of my time with the Reb and Henry: not the conclusion, but the search, the study, the journey to belief." For me, reading and experiencing "Have a Little Faith" was one more step on that journey. Albom has stated that 10% of the profits from this book will be donated to charity, including the Hole in the Roof Foundation, which helps refurbish places of worship that aid the homeless. Find out more at www.aholeintheroof.com. “I am writing a longer piece for Laywitness on “mentor moms,” focusing on the idea that moms who are beyond the baby years have time and wisdom to share with their younger counterparts. Many churches in evangelical circles have established programs that bring younger moms and older moms together in those kinds of relationships. In the Catholic circles I know of, these relationships seem to establsh themselves more informally or organically. Can you help Mary with what promises to be a great article for moms? Email her directly at catholicmentormoms@gmail.com to share your thoughts on this important topic. Is Yahweh pleased by burnt offerings and sacrifices or by obedience to Yahweh’s voice? Truly, obedience is better than sacrifice, submissiveness than the fat of rams. As adults, hearing that we should obey anyone tends to make us chafe a bit. After all, obedience is for children who can’t yet be trusted to make good responsible decisions for themselves. Having reached the age of maturity and gained a certain amount of experience and wisdom in the process, we feel that we should be able to decide for ourselves what the best course of action should be. Yet, a closer look at what it means to truly obey may make us realize that it is a wise course of action. The word “obey” comes from the Latin “ob” + “audire” which means “to listen closely.” Listening is much harder than it seems, listening closely that much more so. Even in our human communications, we rarely give others our full attention. We have one ear to our children while we do our daily chores. We converse with our spouses while watching television or working on the computer. Even when there is nothing physically taking our attention away from the person in front of us, our minds are often elsewhere. We are busy thinking about what we are going to say next or our to-do list for the day. We may hear the words but we are not truly listening. It is hard to give those we are with the full attention that they deserve; the attention that we would like to receive in return. If it is difficult to pay close attention to the person standing right in front of us, how much harder is it to listen closely to God who speaks in quiet whispers? This is no small task in our noisy world. We need to shut off the distractions around us. Perhaps even more difficult, we need to turn off the noise inside our head. We need to focus, so that prayer can become a two way conversation and not just us doing all the talking. God also speaks to us through other means. His Word and intention comes to us through Scripture, through our spiritual leaders, through spiritual readings, and from the wisdom of close friends and family who know us well. When we are truly attempting to listen to God, to obey God, the direction can come in many ways. The key point is that we need to pay attention. We need to be open to God speaking in our lives. God wants us to listen and to do His will. We need to hear it and then do it. Our lives will be better that way. Obedience isn’t a burden; it is a gift. If we can begin to see it that way, perhaps we will be more open to the possibilities it offers for our lives. I'm excited to announce that I will be on the Son Rise Morning Show with Brian Patrick tomorrow morning at 8:20 talking about my article this week on our need to forgive God. It seems particularly appropriate in light of recent events in Haiti. 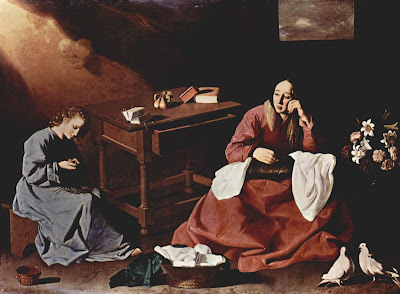 When I was browsing through 30,000 Years of Art , I came across this powerful image by Francisco de Zurbaran of Spain. It was the first time I can recall seeing this painting, "Christ and the Madonna at Home in Nazareth," which was created during the Counter-Reformation period (approx. 1638). It portrays a peaceful moment in their home, but points to the painful suffering to come. Mary takes a break from her sewing to look over at her son. Her eyes are swollen from crying. The young Jesus is working on a crown of thorns (foreshadowing his future suffering) and has pricked his finger while angels look on. It raises the question of just how much they knew of what was to come and how much Mary worried about that "sword that would pierce her heart." It illustrates the weight on the shoulders of a human woman raising a divine son. Book Review: "The Liturgical Year"
Having read several of the books in "The Ancient Practices Series" edited by Phyllis Tickle, I was excited to get my hands on this latest offering. "The Liturgical Year" focuses, as the title suggests, on the feasts and seasons that make up our liturgical year. 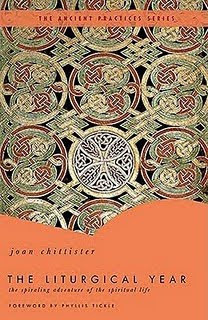 Sr. Joan Chittister, a Benedictine, was an interesting choice for the author of this book in this particular series. Overall, this series has had a decidedly evangelical bent and sought to present the ancient practices from a variety of religious traditions. This offering is 100% Catholic which I am sure aggravated many readers of this series. As a Catholic myself, I was thrilled. Sr. Joan has a mixed reputation among Catholics. Many love her. Many hate her. Some of the books she has written have made my blood boil. Others have been very insightful. This falls into the latter category. It is a well-written introduction to the reasons for our liturgical year and the benefit found in following the seasons of joy and sorrow. Each year that we repeat the process finds us in a different place, with new insights and new wisdom and new challenges to be faced. The liturgical calendar invites us to once again experience Jesus' life and glean the lessons appropriate for us at that moment. "The liturgical year is an adventure in bringing the Christian life to fullness, the heart to alert, the soul to focus. It does not concern itself with the questions of how to make a living. It concerns itself with the questions of how to make a life." The main focus of the liturgical year is the Easter experience. Yet the liturgical year contains four major kinds of celebrations. The first celebration is Sunday, the weekly remembrance of the Resurrection. Second, we celebrate two major seasons - Advent, before Christmas, and Lent, before Easter. Third, the sanctorial cycle commemorates the holy lives of those that have come before. Lastly, Ordinary Time which lasts after Christmas until the start of Lent, and then again after the Easter season until Advent bears witness to the "ongoing presence of Christ in the human community today." Chittister explores each of these four celebrations, both from a historical and a spiritual perspective. She examines the importance of balancing joy and sorrow, fasting and celebration, as well as embracing the "normal" state of Ordinary Time. She also dedicates a chapter to the Marian feasts which celebrate the Mother of God. "The feasts of Mary in the liturgical year are a virtual catalog of the works of God in humanity in the Incarnation of the divine in our midst. She is, the ancient prayer reminds us all, 'blessed among women.' She is simply a woman like ourselves whose acceptance of the will of God changed the trajectory of humanity. The implications for the rest of us are awesome. The implications for women as women are particularly impacting." I can't imagine life without following the liturgical year. It is so much a part of who I am as a Catholic. As Chittister states in her conclusion, "The liturgical year is the experience, in the present, of the mysteries of the past and their promise that the reign of God will, someday, eventually, be fulfilled in the future. It is in the liturgical year where we come to realize that time, life, the real world, is where we encounter God. And that is the essential, the engendering, the ultimate adventure of life." I would recommend "The Liturgical Year" to anyone who wanted a better understanding of why we Catholics celebrate the year the way that we do. 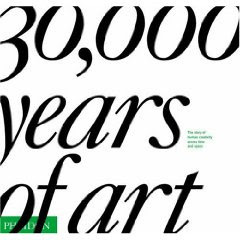 Book Review: "30,000 years of art"
My son picked up 30,000 Years of Art at our library because of his fascination with "big books." This 12" x 12" book with over 1000 pages certainly fits that description. Simply lifting this book counts as exercise. While that may be what attracted his seven year old self, I was excited about the topic. As an art lover, I was interested in this book's unique take on the subject. It presents art works from all over the world in chronological order, one per page. It allows one to easily compare what was going on in the development of art the world over at any given time. The major art works that one would expect are all included, but there are also interesting surprises. Relatively few people would be familiar with all the art works in this book. The descriptions of the art works are intelligent and informative. This book would be a wonderful foundation for a class, but it is just as easily suited to casual browsing curled up in a comfy chair. It is truly a museum in a book with stunning illustrations and quality content. I'm teaching Pre-K through 1st grade CCD this year for my parish. To say that it is a challenge for me would be the understatement of the year. I have fourteen students, most of whom are highly energetic little boys. After sitting through the Children's Mass, the last thing these children want to do is sit through an hour and a half class. They don't like to listen to stories, so I generally try to present the lesson of the week using crafts and games and activities. This week's lesson was on forgiveness. One of the crafts I had planned was a cross with five hearts - one in the middle and one on each of the four extending sections. On the center heart was written "Love is Forgiving." The students could decorate the other four hearts any way that they wanted. My eight-year-old son had created the sample. On his he had used the other hearts to repeat the sentiment in the middle. Many of the students followed suit. One first grader, however, wrote "I am forgiving God" on his outside hearts. On the spur of the moment, I was taken aback by his words. I told him "Well, God doesn't need to be forgiven for anything because he doesn't do anything wrong, but sometimes, it seems like we need to forgive him when we get mad when something goes wrong," and continued on to the next student. I've spent the rest of the day, however, thinking about the idea of forgiving God. What I told the young man was true. God certainly doesn't need to be forgiven by us. He is all-knowing, all-powerful, and all-good. God doesn't make mistakes. From our limited perspective, though, we often see it differently. Natural disasters occur which wreak havoc. Young children suffer with illnesses no one should have to face. Loved ones die just when we need them most. The world is full of evil and pain and suffering and while God doesn't want it to happen, He does allow it. It doesn't make much sense. Some people even use such an argument to maintain that there is no God, or if one exists, He isn't a personal God who cares about us. We believe differently, but it doesn't make being hurt by God any more easy to take. God knows best. We tell ourselves that there is a reason for the suffering. There is a greater purpose behind the pain that someday will be revealed to us. In the next world, all will make sense. But we live in the now. In this moment of our hurt and pain, we often blame God. We question God. We want to know why. We think we know better. In our anger, we need to forgive God - not because He needs it, but because we do. Forgiveness is freeing for the one who offers it. Anger takes a great deal of mental energy and emotional energy to maintain. It can eat you up inside if you let it, pushing out all the joy and happiness and not allowing room for anything else. If one is angry at God, one ceases to see the good that He does in one's life. Everything is seen through that filter of hurt and pain. It is a process, but we need to let go. I think it is important to note that my student wrote "I am forgiving God." It is not a completed action. It is ongoing. We do need to accept that there will always be pain on this side of heaven. We also need to accept that there is a reason for it. Forgiving God can be part of the healing process and bring us into deeper relationship with Him. It is one more step in having complete trust in His will. 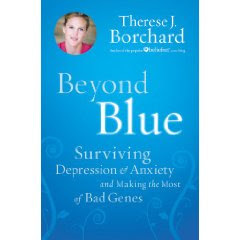 "Beyond Blue: Surviving Depression and Anxiety"
“It’s a clinician’s dream to recommend a resource with such honest and accessible wisdom, research, and guidance from someone who has endured depression firsthand. BEYOND BLUE is the most even-handed account of overcoming depression through psychological and spiritual resources I’ve ever seen.” --Ryan Howes, PhD, licensed clinical psychologist and author of the “In Therapy” blog for Psychology Today. Whatever gifts we offer to God, He will multiply for us. In God's hands all things are possible. "Every Child Brings Us God's Smile." The January 2010 issue of Columbia magazine focuses on the pro-life issue. There are wonderful articles on the Knights of Columbus Ultrasound Initiative which allows women to see their unborn children, thereby greatly reducing the chance that they will choose to have an abortion, on Villa Maria Guadalupe, a pro-life retreat center celebrating its fifth anniversary, and on Maggie's Place - a community home for pregnant women. One article really got my goat, however. "What is a Child Worth?" by Anthony Esolen focused on how, as a society, we do not value children. He rightfully condemns the organization "Planned Parenthood," but then goes on to say, "Even supposing the name 'Planned Parenthood' were truthful, there's something timid and child-hating about the idea that parenthood ought to be planned. A timid person will want at all costs to guarantee his security and to make sure of all eventualities. To paraphrase G.K. Chesterton, if you plan an adventure, you are not on an adventure. If you engineer joy, it is not joy. The best things in life come to us as gifts. If you plan a child, that child is but an egotistical expression of yourself, your vanities and your caprices. The family is good for us, Chesterton says, precisely because it does not conform to our wishes - because every child born to us comes to disrupt our routine. God gives us children to break open that hard shell of self." The last sentence "God gives us children to break open that hard shell of self" I agree with 100%. Children make you much less selfish. Your world revolves around someone other than you on a 24/7 basis. The rest of the paragraph, however, I cannot agree with. ALL children are gifts and ALL are planned by God. All parenting is an adventure, and all parenting offers joy (admittedly sometimes more than others!). Attempting to make responsible choices about when to try to have children is not being timid - it is being mature. For those of us who use NFP, it means not giving into our own desires at all times. It requires sacrifice and communication. The idea that any child is planned by us is insane. We humans cannot plan children. We can only place ourselves in a position that makes conception more likely. Ask any number of people who are struggling to have a child, God decides when and if it will happen. God also decides when we need a child, even if we might be of a different opinion. I have a surprise child and he is a tremendous gift. God knew how much we as a family needed him. I've heard of people who have become pregnant using every birth control method known to man (even sterilization). If God thinks it is time for you to have a child, there is no standing in His way. ALL children are planned by God. Today, January 4th, is the feast day of St. Elizabeth Ann Seton. The first American born saint, Elizabeth Ann Bayley was born in August 1774 into a prominent New York City Episcopal family. Her mother died when she was three and she was extremely devoted to her father, who was a doctor, and her new stepmother who provided her religious education. At age 19 she married William Magee Seton, the son of a wealthy shipping merchant. In quick succession she gave birth to five children, three daughters and two sons. In spite of her busy life, she managed to find time to engage in work with New York's poor. She and her sister-in-law Rebecca Seton established a society for widows and poor children which led to them being called "the Protestant Sisters of Charity." Unfortunately, within the first ten years of their marriage, the Setons faced a harsh decline in both William's health and their financial situation. They declared bankruptcy and were encouraged to travel to Italy in the hope of helping William's health. Elizabeth sold their last few possessions in order to pay for the trip. Their intent was to meet up with their friends, the Felicchi family, but due to the yellow fever epidemic in New York, they were quarantined for forty days when they arrived. In the midst of extremely harsh conditions, Elizabeth cared for her husband, whose health was deteriorating rapidly, and her eldest daughter Anna Maria who had joined them on the journey. Despite her efforts, William died two days after Christmas. Elizabeth was finally allowed to meet up with the Felicchis who took in the widow and her daughter for a time. During this period, she was introduced to the Catholic faith. Upon her return to New York, she went ahead with plans to be confirmed a Catholic, even though doing so meant that she would be financially cut off by both her own and her husband's family. Attempting to support her family on her own, she opened a boarding school for boys, but when the parents discovered that she was Catholic, they withdrew the pupils. She considered moving to Montreal but then the Archbishop of Baltimore asked her to begin a Catholic school for girls in that city. Elizabeth herself died of tuberculosis at the age of forty-seven. By that time, there were twenty houses of the religious order. She was canonized in 1975 and is considered the patron saint of widows, parents who have lost children, and those who have difficulties with their in-laws. Jones, Kathleen. Women Saints: Lives of Faith and Courage. Maryknoll, NY: Orbis Books, 1999. What was the first rule of our dear Savior's life? You know it was to do his Father's will. Well, then, the first purpose of our daily work is to do the will of God; secondly, to do it in the manner he wills; and thirdly, to do it because it is his will. We know certainly that God calls us to a holy life. We know that he gives us every grace, every abundant grace, and though we are so weak of ourselves, this grace is able to carry us through every obstacle and difficulty. Aaron Ajax is a sixth grader who has not has much change in his life. He has had the same best friend since the first day of kindergarten. He has never moved. There has been no hardship or uncertainty. When his father loses his job, Aaron faces many changes. He has a difficult time dealing with these changes and does not understand why God is not answering his prayers the way he would like. Things turn around for Aaron when he stops trying to make things happen and begins to rely on God. Once he realizes that he should just be himself, things get better. He risks losing his new friends by doing what is right instead of what is easy. 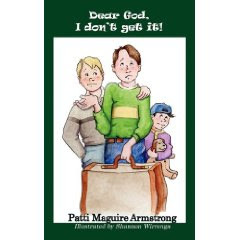 Patti Maguire Armstrong does a great job exploring Aaron’s feelings through these changes in this easy to read book. She skillfully demonstrates that children often have the same difficulties in their faith lives as adults have, and that they may feel alone and unable to express these feelings. There are vocabulary words and thought provoking questions for each chapter. These are located in the back of the book. The only thing I would have done differently in the book is to place the questions and vocabulary for each chapter at the end of each chapter instead of separating them into the back of the book. An advanced third grade reader would have no difficulty with this book, and it would be appropriate for children through sixth grade. I will be using this book in my home school to help my son understand to trust God always, even in difficult circumstances. 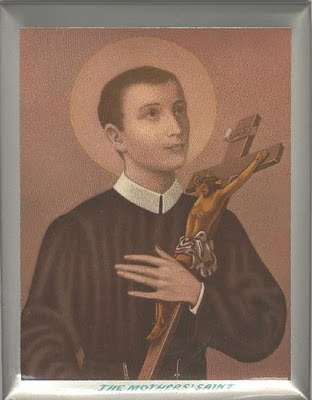 Born April 6, 1726 in Italy, Gerard Majella was the youngest son of a tailor and his wife. His mother often brought Gerard and his three older sisters to daily Mass with her. Even as a child, God blessed him in extraordinary ways. At four years old, he ran to his mother after Mass and held out a small roll, saying, “Mama, see what I got from the little boy!” His mother didn’t pay much attention, except it kept happening every day. She decided to watch at a distance to find out who this “little boy” was. The statue of Our Lady of Graces in Capotignano was coming to life! He was receiving the bread from the Christ Child himself! His father died when he was twelve years old and the family was left in poverty. He went to work as a houseboy for Bishop Albini at Lacedonia. He became well-known for his kindness, visits to the poor, and his compassion. He became apprenticed to a tailor and eventually took over his father’s former shop. He was good at his job and was well-respected in the community, but his heart was restless. He wanted more. He applied twice to become a Capuchin, but was turned down because of his health. He resolved that if it was God’s will that he live a holy life as a tailor, then that is what he would do. On April 13, 1749, a representative from the newly formed Congregation of the Most Holy Redeemer spoke at Mass. Gerard decided he wanted to join them as a lay brother. Like the Capuchins, these missionaries wanted nothing to do with him. Gerard was not to be turned down, however. He chased them down the road for 12 miles! He begged and pleaded until finally they relented, convinced he would be a worthless addition to their order. Despite their initial reluctance, he turned out to the ideal brother. He taught at the local seminary. Even though his own formal education had ended when he was twelve, the students were amazed by his wisdom and insight. He told stories to children and taught them to pray. He also had the gifts of reading souls and curing the ill. If he did not cure someone who asked for his help, he would tell them the reason why. He also had the ability to tell people when they would die. Near the end of his life, he was accused by a woman of fathering her child. When questioned by his superior, he remained silent. He was told to stay in the monastery and have no further contact with the public and not to go to communion. This was an extremely hard punishment for him. When the woman finally recanted, his superior asked him why he had not defended himself. He replied that their rule forbade making excuses. Gerard died on September 5, 1755 at age 29 of tuberculosis. Before his death, he asked that a simple white placard be placed on his door. It said “Here the will of God is done, as God wills, and as long as God wills.” He was canonized on December 11, 1904. He is the patron saint of children (especially unborn children), expectant mothers, and falsely accused people. This was in my parish bulletin this week. It is a good way to start the year. Walk with me, please, in every day and every hour of this New Year that the light of Christ might shine through me, in spite of my weaknesses and failings. Above all, may I remember this year that I am a pilgrim on the sacred path to You.